Over the past five years several PADI courses have been revised: the Instructor Development Course, Rescue Diver and Divemaster courses. An evaluation of the Open Water Diver Course has been part of the overall plan, and its revision is the culmination of two years of analysis, planning and development. You can begin teaching the revised course as soon as you access the updated material and have familiarized yourself with the changes. This bulletin and the Fourth Quarter 2013 edition of The Undersea Journal contain articles to give you background and rationale for the changes. The required implementation date is 1 July 2014 for teaching courses in English and six months after the first quarter 2014 release of Dutch, French-, German, Italian and Spanish materials. Look for implementation dates for these and other languages to be announced by your PADI Regional Headquarters. While the main course structure has not changed, the course content and associated teaching material have evolved. The Open Water Diver Course Instructor Guide and PADI’s Guide to Teaching section - "Open Water Diver Course - Conduct and Skill Recommendations" are also revised and will be incorporated into the respective products in 2014. In the meantime, you can download replacement pages for these reference manuals from the PADI Pros’ Site under Training Essentials/Curriculum. Similarly, the PADI Course Director Manual and PADI IDC Lesson Guides are scheduled for revision in English, with other languages to follow. PADI Course Directors can download replacement presentation notes and revised lesson guides from the PADI Pros’ Site under Training Essentials/Curriculum/Instructor Development/IDC. Next you’ll find an overall summary of changes to give you an at-a-glance look at what to expect before you peruse the revised materials yourself. Air management - used to describe the new requirement for student divers to know their air supply level at all times and plan dives considering air supply. Good surface habits - used to describe being positively buoyant, keeping the mask on and regulator or snorkel in whenever at the surface. Proper lifting techniques - introduced to describe how to lift heavy equipment by using the legs with a straight back. - Pressure, volume and density concepts now introduced before buoyancy. - Dive computer use is assumed, and information from the How to Use and Choose Dive Computers book is integrated into the knowledge development. - Air management concepts are introduced, now including how to plan reserves for safety stops and air supply turn points. - Gas narcosis is now in Section Five. This helps student divers better separate the problems - DCS, contaminated air and oxygen toxicity - from gas narcosis causes, signs and symptoms. - Disconnect low pressure inflator skill - was in Dive 2, now dive flexible. Gives children and others who may have difficulty with this skill more time to master it. PADI Scuba Divers need to master it by the end of Dive 3. - Loose cylinder band skill - new skill, dive flexible and either done in the water at the surface or underwater to give practical experience in overcoming the common problem of cylinders becoming unsecured. - Weight system removal and replacement at the surface - now dive flexible. PADI Scuba Divers need to master it by the end of Dive 3. - Emergency weight drop skill - new skill, dive flexible. Objective is to have student divers ditch weight as they would in an emergency so that they feel instant positive buoyancy. This skill can be done in either confined water or open water. - Staying within reach of buddy and good surface habits - now formalized with performance requirements. 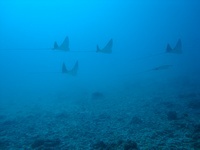 - Descent and ascents and environmental awareness - further emphasizes BCD use for control. For example, in Dive 4 student divers stop their descent before touching a simulated sensitive bottom, and begin an ascent while neutrally buoyant over a simulated sensitive bottom. - Air management skill - now student divers must indicate remaining air supply within 20 bar/300 psi without rechecking the SPG. - Alternate air source use while swimming - student divers still swim while sharing an alternate air source for at least one minute, and now the swim ends with an ascent to the surface and the out-of-air diver orally inflating the BCD for positive buoyancy. This allows the divers enough time to experience what it’s like to share air, and reinforces the protocol of surfacing and establishing buoyancy in an out-of-air situation. mask remove and replace skills. balanced and comfortably in a horizontal position. - Buoyancy - new emphasis to increase buoyancy practice and application, conduct as much of the training as possible while students are neutrally buoyant (rather than sitting on the bottom), as reflected in diver materials. - Minidive - on Dive 5, student divers plan and execute a dive to practice skills and respond to situations that you present including: leg cramps, out of air/share air, free flow regulator, mask flooded or off, regulator dropped from mouth, BCD inflator failure and buddy separation. Minidives may be added to Confined Water Dives 2-4. - Proper lifting techniques - student divers now learn how to care for their backs when lifting scuba equipment, by using their legs with a straight back, and put this into practice in both confined and open water. - Dive 1 now has skills - including hand signal recognition, partially flooded mask clear, and recover and clear regulator. Please see the following article on Discover Scuba Diving crediting procedures in this Training Bulletin for related information. - Inflatable signal tube use - new skill, dive flexible. Student divers must deploy an inflatable signal tube at the surface, or deploy a delayed surface marker buoy (DSMB) from underwater. This means student divers either need to have their own device to use, or you must supply them. - Safety stop - the instructor-evaluated stop remains dive flexible, but now student divers must make a stop on Open Water Dive 4 and it is encouraged on all other dives. This means that instructors may evaluate the stop on any dive, but student divers must still do it on Dive 4. If an instructor evaluated it on an earlier dive, then a certified assistant may evaluate it on Dive 4. - Trim check - new step, similar to determining and adjusting trim performed in confined water. Once trim is set, the checks become simple confirmations that the diver is trimmed properly. - Tired diver tow - no longer required for PADI Scuba Diver certification. - Audible signal - Instructor now introduces and employs an audible underwater signal. Divers understand that upon hearing it, they must look at the instructor for direction. - Dive 4 has buddy teams plan and execute the dive - If all dive-flexible skills have been completed on previous dives, Dive 4 is free of staged skills. In the revised course, student divers build on the confined water minidive experience and plan the dive based on the parameters you define for the site; then follow that plan, with you directly supervising. You may have the class stay as a group, or buddy teams may be accompanied by you, or by a certified assistant under your indirect supervision. The goal is to give student divers first-hand experience in carrying out a dive and all that it entails, while still under the watchful eyes of a PADI Professional. The revised paper manual will be released in English during the fourth quarter 2013 and released in Dutch, French, German, Italian and Spanish during the first quarter 2014, with other languages following. The PADI eLearning® program and new Open Water Diver Touch will be released in English during the first quarter 2014. - PADI Open Water Diver Video - All new footage focusing on skills and skill application. The English version will be released during the fourth quarter 2013. Full voice-over versions for other languages will follow in 2014. - Open Water Diver Course Prescriptive Lesson Guides - updated, redesigned and streamlined to present the question, then the answer, then a prescriptive explanation with easy navigational controls. - Instructor Cue Cards - both confined and open water cue cards are updated with skill performance requirements, including the full details of conducting the Controlled Emergency Swimming Ascent in open water. - Open Water Diver Course Quizzes and Exam - updated exam booklet plus answer sheet and answer key. - PADI Skill Practice and Dive Planning Slate - in confined water, student divers use this slate for two purposes: 1) to indicate on the slate if they’re comfortable, or want more practice, with each skill. This helps you assess confidence as well as ability. 2) Student divers apply foundational dive planning theory to practical use as they plan minidives using the dive planning side of the slate. This is taken a step further as students use it to plan open water dives in buddy teams, determining turn pressure, and noting log book information. See The Undersea Journal for more information about the revised Open Water Diver Course. As you’ve learned, the revised PADI Open Water Diver Course now includes skills such as partially flooded mask clear and regulator recovery and clear on Open Water Dive 1. This means that Open Water Dive 1 no longer mirrors the optional open water dive in the PADI Discover Scuba Diving program. As a result, the DSDTM open water dive does not credit toward the revised Open Water Diver course. - Use the Discover Scuba Diving Participant Guide as designed to handle administrative forms, to conduct the DSD briefing and to give participants the benefits of the DSD experience. 1) Conduct the Open Water Diver course Confined Water Dive 1 briefing and Confined Water Dive 1. 2) If desired, conduct Open Water Diver course Open Water Dive 1 briefing and Open Water Dive 1. In this way you can promote the experience as a PADI Discover Scuba Diving experience that credits toward certification. Document the relevant portions of the course completed on the PADI Open Water Diver Course Referral Form (Product No. 10056), and give a copy to the participant in the event the participant will finish the remaining Open Water Diver course segments with another instructor (referral). Participants who want to continue toward certification need to enroll in the Open Water Diver course, complete course administrative forms and receive course materials. Note that the new PADI Discover Scuba Diving Participant Guide (Product no 72200) includes two dive log pages, one for the confined water session and one for the optional open water dive. These pages serve as an excellent memento of the experience and are not designed to document Open Water Diver course dives. What is a fair price for a properly given full Open Water Diver course?